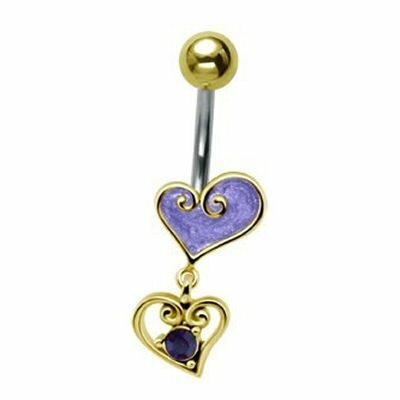 Bright and glamorous, this purple heart belly bar is a great way to show off your piercing. This belly bar features gold and enamel hearts with a sparkling amethyst jewel. It catches the light beautifully and looks simply stunning against your skin. This heart belly bar has a surgical steel stem with gold-plated hearts. The steel stem is non-irritating and easy to clean, so it feels very comfortable to wear. This belly button bar is easy to wear and comes in a choice of lengths to suit your needs.